Where we bring you guys some raw pallet wood creations made by us, meanwhile we also bring you some other pallet wood ideas by some professionals who are doing it on really some next level. 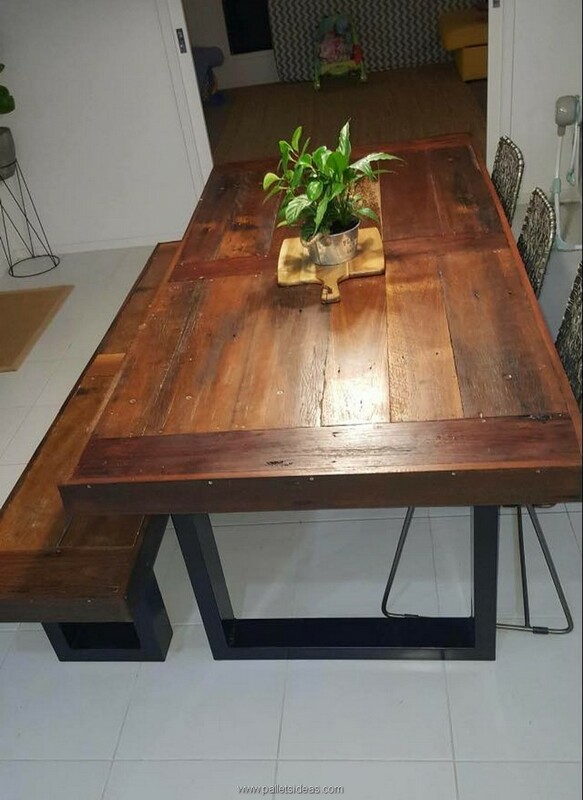 Here is a similar reclaimed wooden pallet dining table. 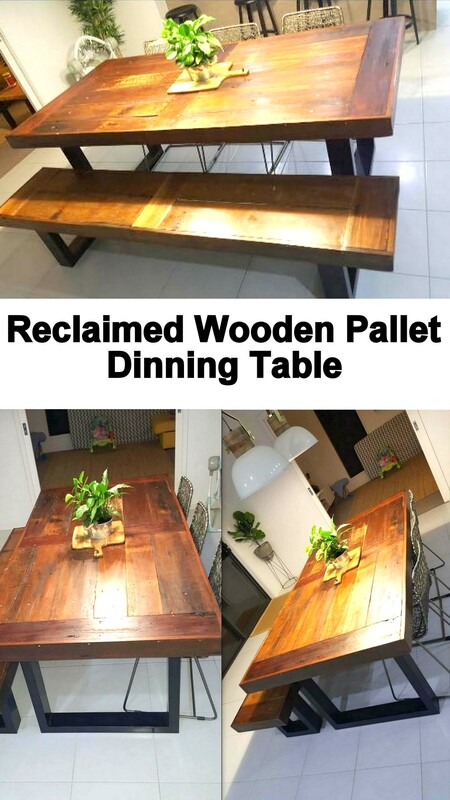 As the title makes it pretty clear that not the entire table is made with the shipping pallets, but some part of the table was reclaimed from some old discarded wooden furniture article. You guys are going to find out the whole project right here and also the details about the reclaimed portion, I am sure you would adore this table. 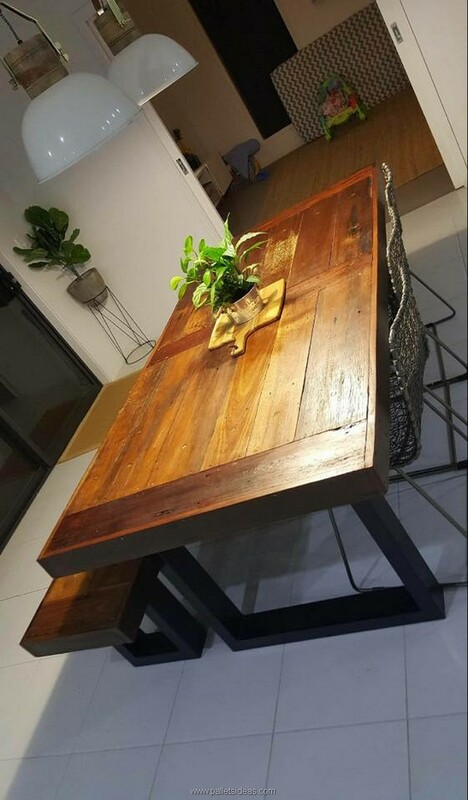 First of all we are concerned to find out the reclaimed portion of this pallet wooden made dining table. Well, this is there in the bottom of the table. Do you see the stylish legs of the table? This is a stand like object which is completely different from the typical legs, this clearly seems the creation of some professional. 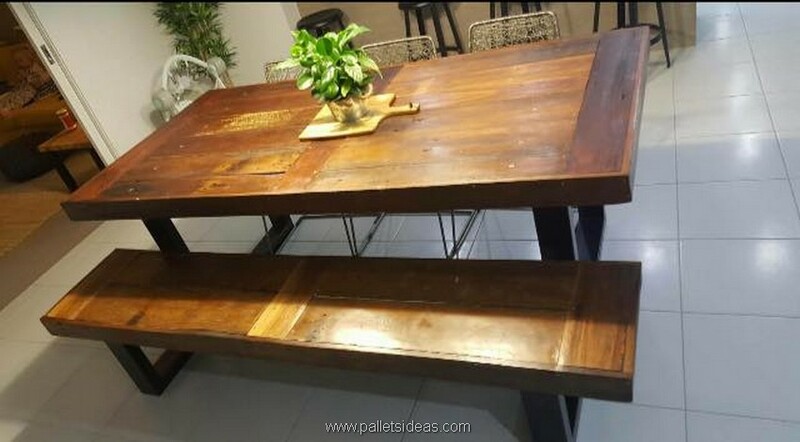 Other than that reclaimed part of this pallet wooden made table, entire frame is made with pure shipping pallet planks. One thing must be mentioned here that these shipping pallets are relatively bigger than the ones we normally use. This can be seen from the width and also the thickness of each wood pallet planks. So overall this is something that can be brought right inside a lavishly and extravagantly designed and decorated house because the shade that we have given to the table is so classic and eye catching. This just looks like another wooden creation bought from some expensive branded furniture showroom as we have done a lot of work on the finishing and sanding of this specific article. Especially the reclaimed legs have revived it and given it a new whole life.